Credit: Illustration: NASA/CXC/A.Hobart; Spectrum: NASA/MIT/T.Fang et al. Four independent teams of scientists have detected intergalactic gas with temperatures in the range 300,000 to 5 million degrees Celsius by observing quasars with the Chandra X-ray Observatory. 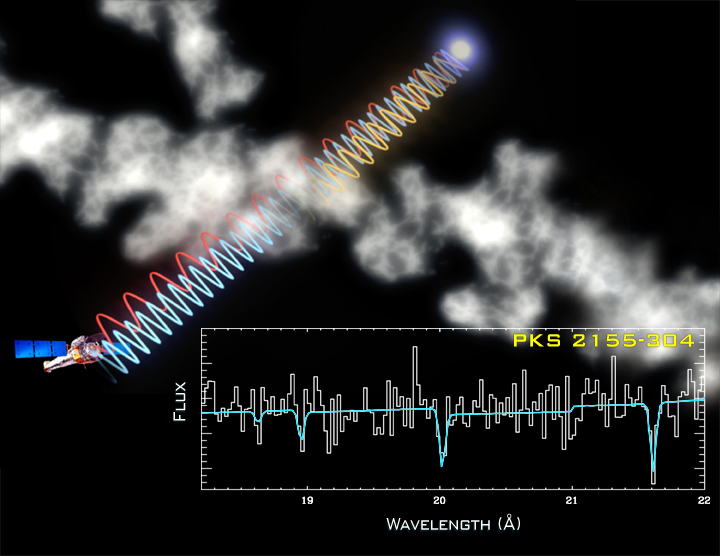 An artist's rendering illustrates how X-rays from a distant quasar dim as they pass through a cloud of the intergalactic gas. By measuring the amount of dimming due to oxygen and other elements in the cloud - see the spectrum of the quasar PKS 2155-304 in the inset - astronomers were able to estimate the temperature, density and mass of the absorbing gas cloud. Observations of PKS 2155 and the quasar H1821+643 by an Ohio State group revealed various parts of the hot gas system. One of these appears to be a filament in which the Milky Way and Andromeda galaxies are embedded, whereas other detected portions are at distances of a few billion light years from Earth. The hot gas, which appears to lie like a fog in channels carved by rivers of gravity, has been hidden from view since the time galaxies formed. It is thought that this gas forms part of a gigantic system, or web, of hot gas and dark matter that defines the cosmic landscape. The hot gas part of this system could contain more material than all the stars in the universe. Ultraviolet telescopes had detected cooler components of the hot gas system, but most of it is now known to be detectable only with an extremely sensitive X-ray telescope. The hot gas detected by Chandra can be used to trace the more massive dark matter component. Eventually, astronomers will be able to use the hot gas to map of the distribution of dark matter in the universe and perhaps understand its origin. Credit Illustration: NASA/CXC/A.Hobart; Spectrum: NASA/MIT/T.Fang et al. Coordinates (J2000) RA 21h 58m 52s | Dec -30° 13´ 32"